This small quilt is for the ALQS8 (another little quilt swap #8). It is my attempt at an Escher-like effect as the quilt actually works in all directions as you can tell from this diptic photo collage. I used the photo to poll friends for which way it should hang. The majority agreed the top one on the left. Here's the finished quilt. It is machine pieced and quilted. It measures 18.5 inches square. Here's the back. I still need to add the sleeve to the back for hanging. 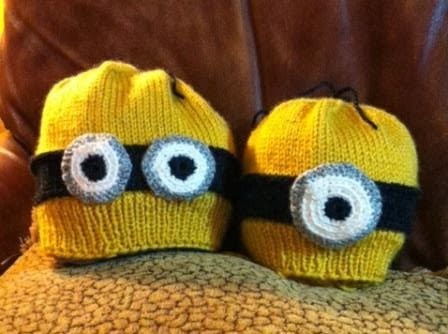 I only intended to make one or maybe two minion hats but three friends asked me to make some for them. 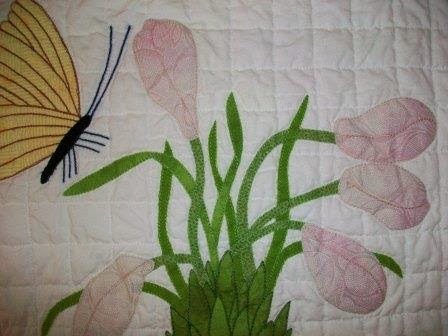 I sent this one off to a great-niece whom I hope will like it. 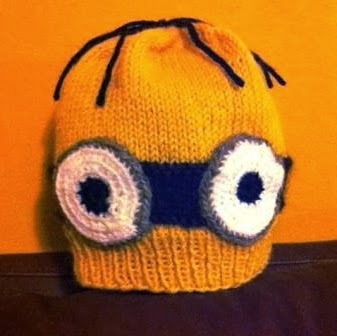 The pattern is Minion Hat by Maura Houston. The yellow yarn for this one is Berroco Ultra Alpaca. I used scraps for the black, white, and grey from my scrap basket. 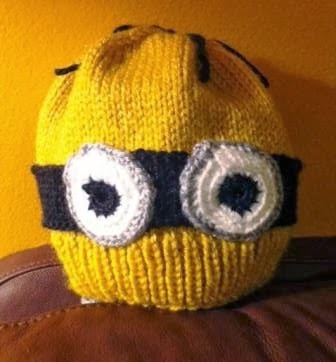 And the second one was made for a friend's son. 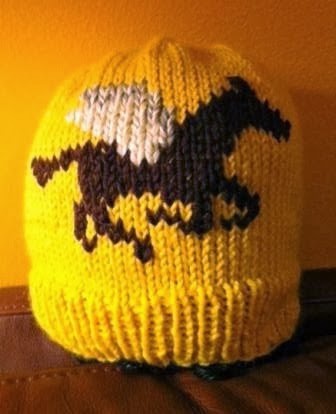 The yellow yarn is Lion Brand Vanna's Choice Prints. Again the black, white, and grey are from my scrap basket. Four more minion hats have been knitted at the request of friends. This one is not a minion hat but rather uses the pattern Percy Jackson's Camp Half~Blood Beanie by Nancy Fry. The yellow yarn is left over from the first minion hat. The duplicates stitches for the horse were down using brown, white, and grey yarns from my scrap basket. Hope my great-nephew like it. I have a lot of nieces (11)/ nephews (11)and a growing number of great-nieces (up to 8) with two new ones this year) and great-nephew (3 now). I've been on a roll this year with knitting gifts for some of them. 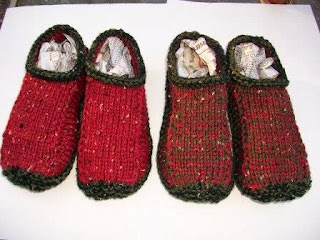 These first two were made using left over yarn from the slippers. Both were made using the pattern Regular Guy Beanie by Chuck Wright. Both went to great-nephews for Christmas. 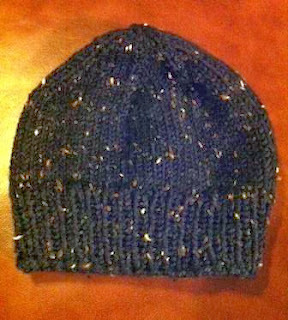 I downsized the regular guy beanie pattern, casting on only 72 stitches rather than 84. I used the regular guy beanie pattern for this one for a nephew. 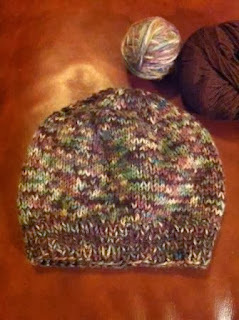 I used two yarns from my stash (the brown is Berroco Ultra Alpaca; the other is leftover Maine Woods hand painted wool). The effect was almost camouflage. This one will go to a great-niece. The pattern is Purple Stitch Project Beanie by Paula Pereira. 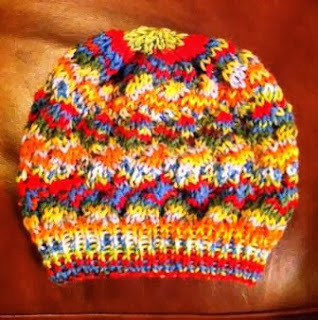 The yarn is Adriafil Knitcol. This one is didn’t photograph well. The colors are pink and orange. Another great-niece will get this one. 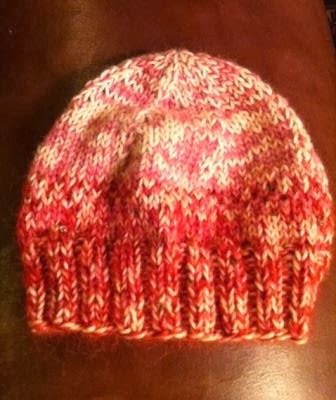 The pattern used is Hermione's Globe Hat by Margie Mitchell. The yarn is Manos del Uruguay Maxima in peach melba. This one (for another great-niece) uses the same Manos del Uruguay Maxima yarn. 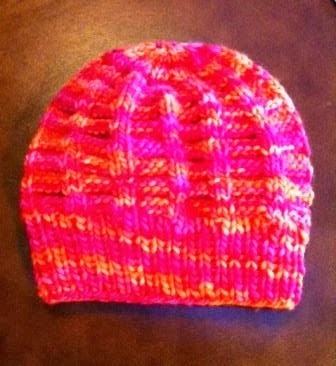 The pattern is Techno Hat by Colleen Powley. These two are for twin girls (great-nieces). I downsized the regular guy beanie. Unsure what the yarn is. These fingerless mitts are at the request of a brother-in-law with large hands. The mitts are large on me so hopefully will fit him. 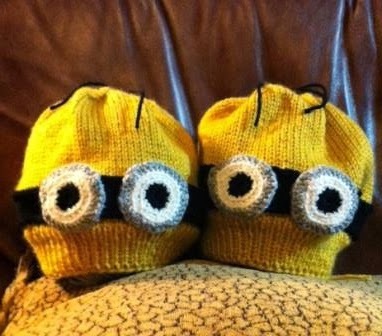 The pattern is Man Paws by Chelsea Fabrizio. The yarn is Lion Brand Heartland. Here are the details on the block requirements (link removed 3/2017). Here’s an old post about the time I worked for NASA during the summer between my first and second years of medical school -- My First Research Experience. These Ashbury mitts were fun to knit as I enjoy knitting fingerless mitts and I enjoy lace knitting. 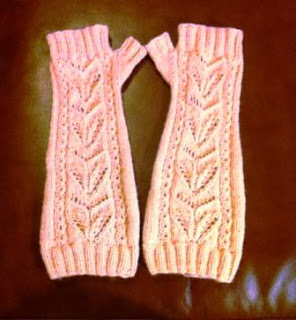 The pattern is Ashbury Mitts by Simona Merchant-Dest. The yarn is Bijou Spun by Bijou Basin Ranch Lhasa Wilderness (75/25 Yak & Bamboo) in a lovely cream color (the photo does not do it justice). These are for one of my nieces. 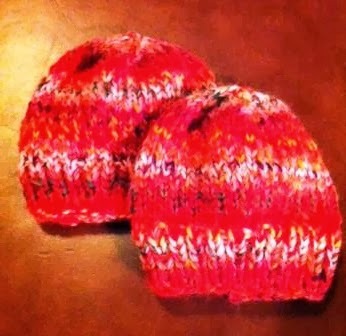 With the leftover yarn I made two baby hats. 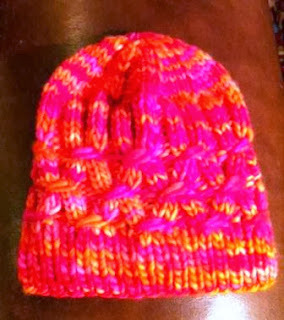 This first one is a Christmas gift for a grand-niece who was born this fall. 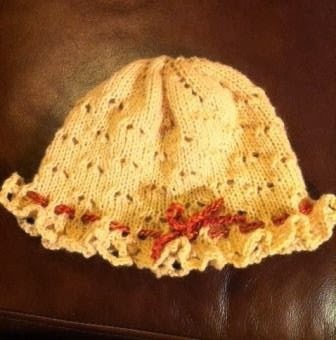 The pattern is Lacy baby / toddler hat by Linda Kuzma. I used some unknown leftover pink yarn to crochet the ribbon. 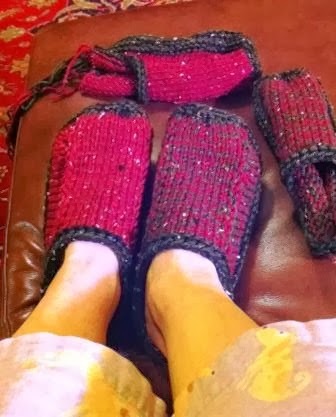 This one used not only the leftover yarn from the Ashbury mitts but also yarn left over from two other projects -- Malabrigo Yarn Lace in dusty rose (left over from the swirl jacket) and Rowan Kidsilk Haze Glamour in blood red (left over from the modified girlie mitts). There was only enough of the Kidsilk for the lower half. It’s a little small so not sure it will fit the other grand-niece born this year or not. I may have to donate it to the local children’s hospital. I have finished the quilt except for adding the sleeve for hanging and a label. The quilt is machine appliqued and quilted. It measures 31.5 in square. 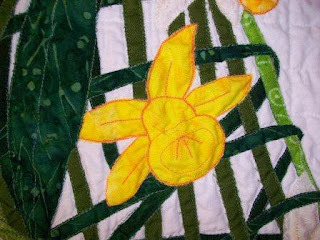 The next several quilts are my attempt to show the details of the quilt. Here is the toe of the shoe. There’s a small blood stain near the daffodil closest to the toe which is difficult to see in this photo but easy to see in this instagram photo. It' didn’t come out. I may have to add a ladybug or bee to cover it. Here is the heel of the shoe. 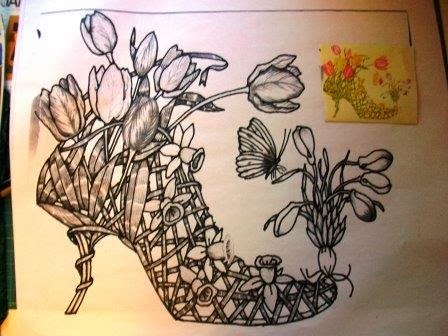 The flowers around the "ankle." The butterfly and flower buds. 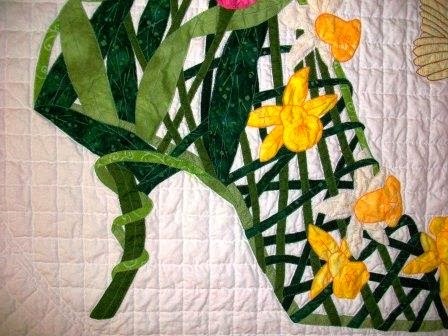 One of the daffodils and the straps across the instep. I plan on entering the quilt into The Great Arkansas Quilt Show 3. 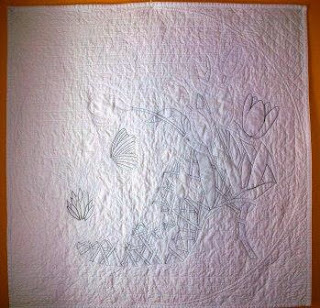 Not sure this one will win anything but I did win best hand quilting in The Great Arkansas Quilt Show 2 back in 2007. 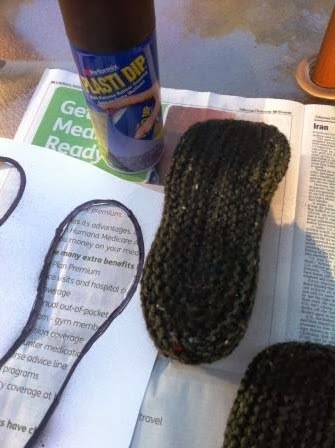 I really like how these slippers turned out. The pattern is Non-felted Slippers by Yuko Nakamura. It suggested so Yorkshire Tweed Chunky which I couldn’t find so I ordered Plymouth Encore Tweed Chunky. The first one I knitted single strand was too flimsy so I decided to knit them using two strands of yarn which turned out lovely. 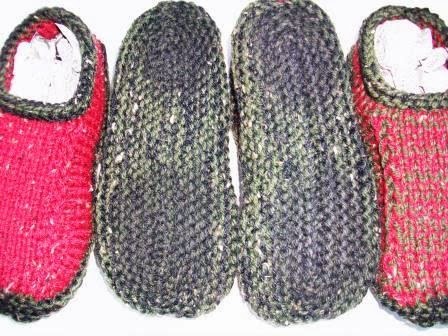 The soles are a blend of black tweed (color #217) and grey tweed (color #3525). 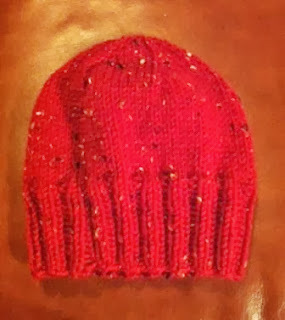 The tops or insteps of the one on the left used two strands of red (color #6389) while the one on the left used one strand of red blended with one of grey. They fit my husband's feet (though I didn't manage to get a photo of him wearing them). He's a size 9. Here you can see them on my size 8 feet. In an attempt to make them skid resistant, I used the technique suggested in this blog post (link removed 3/2017). My husband found the Plasti Dip for me at Home Depot. I might should have added another layer of the Plasti Dip but I could definitely feel the resistance on my wood floors. I finished this sweater recently. I used the pattern Niche by Norah Gaughan. 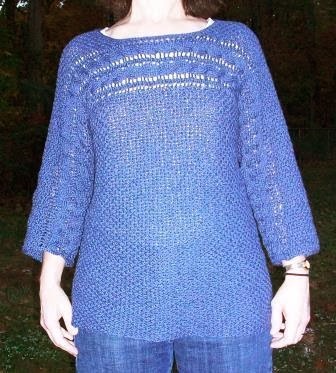 The yarn is Berroco Maya™ in blue, color 5632. When I first tried on the finished sweater the boat neck was very stretchy and wanted to constantly fall off the shoulder. 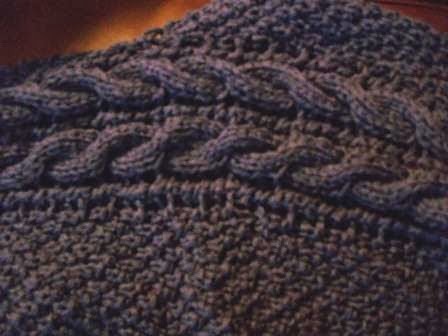 I decided to do two rows of single crochet around the neckline to prevent that effect. For me, it's much more comfortable now. I really thought I got the sleeves the same length but looking at the photo above it looks like the right sleeve may be shorter than the left by a 1/2 or so. Oh well, I didn't notice it when I wore it. 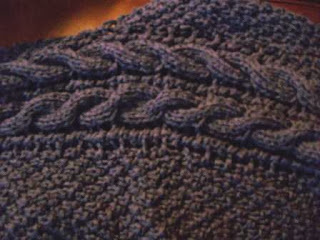 Here you can see the cable pattern goes from one cuff to the other across the front. I wore a short sleeved scoop necked white t-shirt under the sweater. It's tucked into my jeans which is why the upper part of the sweater looks lighter than than bottom. Here's the back. 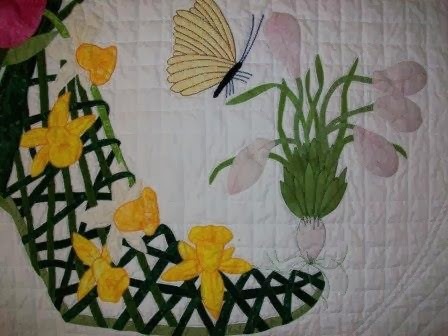 Let me refer you back to the these two previous posts (beginning, part 2) for the back story of this quilt. 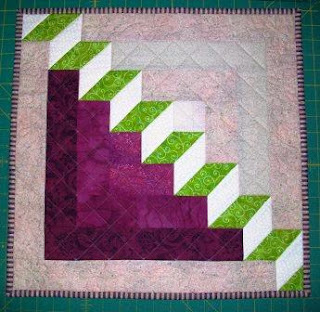 It took me a while to decide how I wanted to do the actual quilting. As you may notice in the photos below I made a few false starts with my marking. 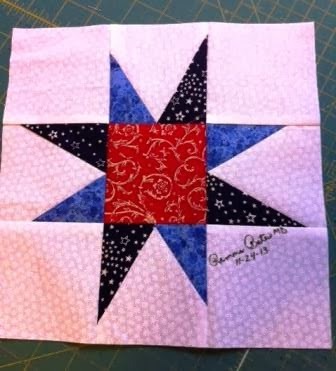 I'll have to be careful when doing the quilting to not take a wrong turn onto those false start marks. I finally settled on a circle around the shoe. 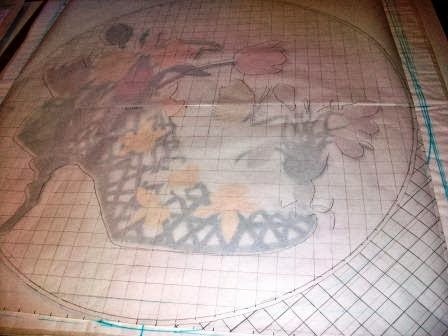 Inside the circle will be hatch quilting in a horizontal direction. 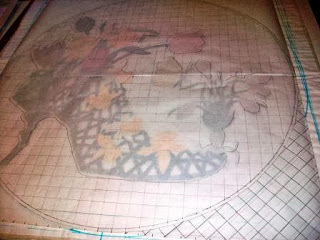 Outside the circle will be hatch quilting on a 45 degree angle. 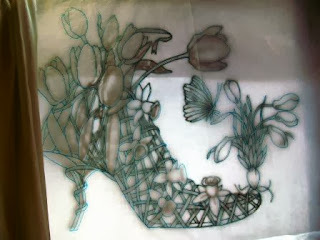 The shoe will be outline quilted. All of that will be done with white thread. Then I will most likely do some additional quilting on top of the larger green leaves and tulips, we'll see. 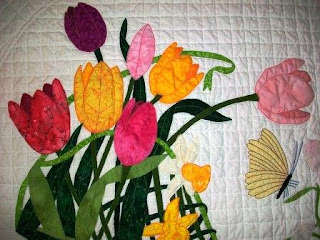 In this photo, you can see the freezer paper I used to sketch my quilt design (after I had made the earlier false starts). I marked the actual quilt using the freezer paper to get my outside square marked, then trimmed each corner from the circle and marked the circle. And here is one corner marked. I don’t plan to mark the inner hatch marks until I have stitched around the shoe and stitched the circle plus another inner circle 1/4 inch from the original circle. See the prior post for the back story on this quilt work-in-progress. 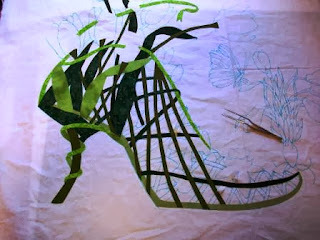 After placing all the small pieces and fusing them into place it was time to do the detail stitching. 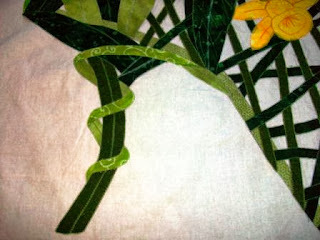 These photos show some of the stitching. This first one shows the entire quilt top. This one shows the heel of the shoe which I love. 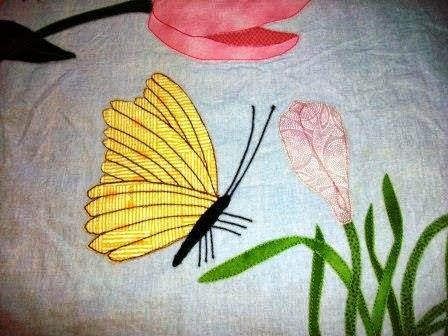 Here is the butterfly which really came alive with the stitching added. 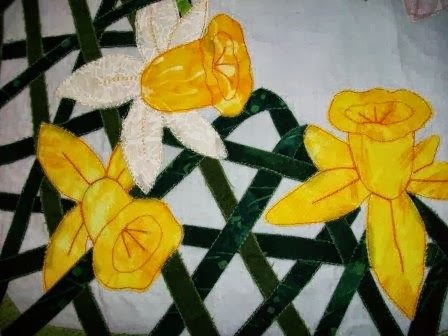 I really like how the daffodils came out. The tulips may need a bit more work. 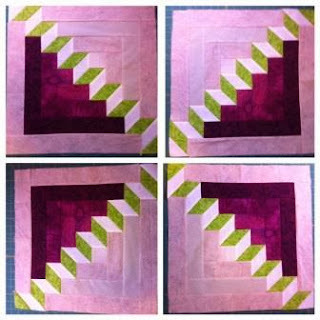 Now it's time to put the top, batting, and backing together and come to a decision regarding just how the actual quilting will be done. I've taken on more ambitious knitting projects this past year. This latest project uses the pattern Niche by Norah Gaughan. 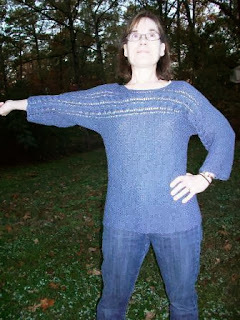 The yarn is Berroco Maya™ in blue, color 5632. 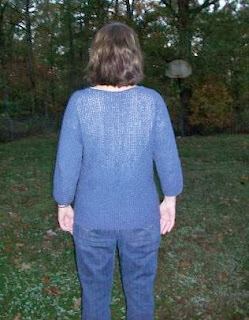 The sweater is knitted from the left sleeve cuff to the right. I have made it past the boat neck to the right shoulder region. I love the way the yarn feels. Here you can see the cable a little better. I am looking forward to wearing this one. This quilt story will be told in multiple posts as I progress from the beginning to the quilt's completion. 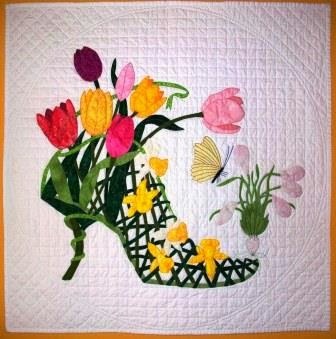 The inspiration for this quilt came from an old Stuart Weitzman shoe ad that I tore out of a magazine (don’t recall which magazine or the year) and saved. Recently I decided it was time for this photo to become a quilt. First step was enlarging the original photo. 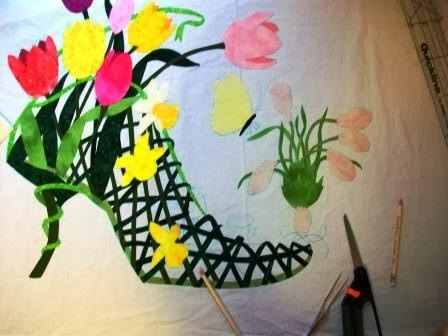 This was done by using FedEx Kinko to enlarge the origin 400% onto one large piece of paper. Here you can see the sheet with the enlarged photo in black and white and the origin in the upper right corner. The next step was to use my living room window as a light box to transfer the drawing/sketch to the white background fabric. 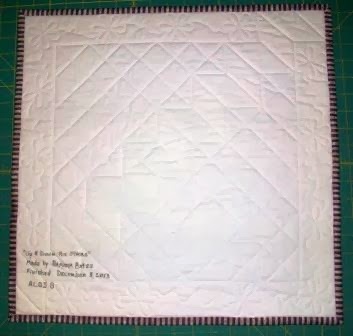 As this quilt will be used as an “art piece” or “wall quilt” I decided it would be okay to use a raw edge fusing technic for fabric “puzzle pieces.” I used Pellon EZ Steam II for my fusible web. 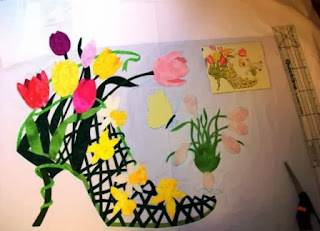 I used freezer paper to make a pattern for each individual piece. I quickly discovered I really needed to think “ahead” so that the background pieces where added first. It is best not to have to lift these small pieces and reposition them too often. 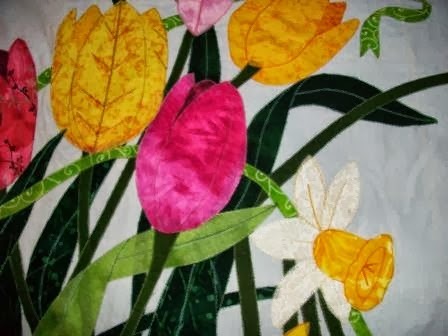 I had to lift and trim some of the background green stems/leaves so they wouldn’t show through the light flower fabrics. That was just a bit tricky, a little scary, but I managed to do it. Those forceps you see in the above photo was a huge help. All the fabric “puzzle pieces” are now in place. 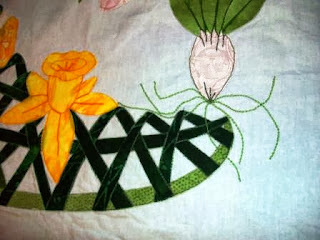 Next stage will be doing some detail stitching before I make the quilt sandwich. 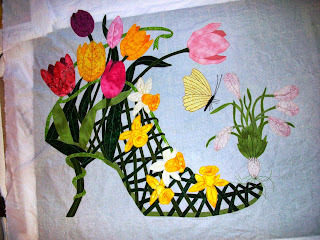 The quilt name – fantasy footwear – popped into my head as I was getting started late summer and football season was getting ready to start too. Several stories regarding fantasy football were in the news. It seemed so appropriate. 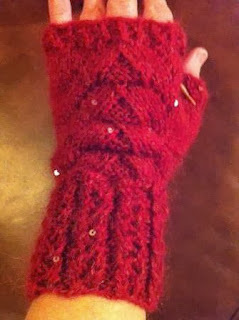 I liked the cuff and back of this fingerless mitten pattern. I didn't like the way the thumb was done, no gusset. So I changed it. I "rewrote" the pattern (Girlie Mitts by Kristle Chester) to include a thumb gusset and to add the trim at the palm edge that mirrors the cuff. 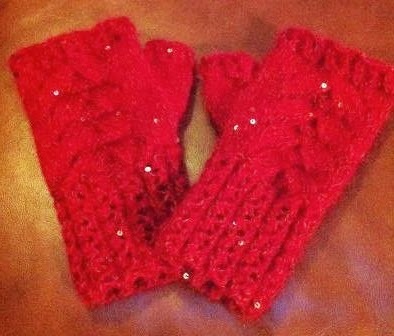 I knit them using two yarns knit together: Lion Brand LB 1878 and Rowan Kidsilk Haze Glamour (has sequins). They fit nicely though I wish they were just a bit snugger. Here are my changes to the pattern as per left mitt. The right mitt changes would mirror these. Round 25: p1, K29, *p1, K4* to end. 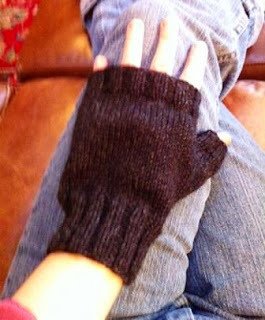 Row 32 is where I started the thumb gusset. 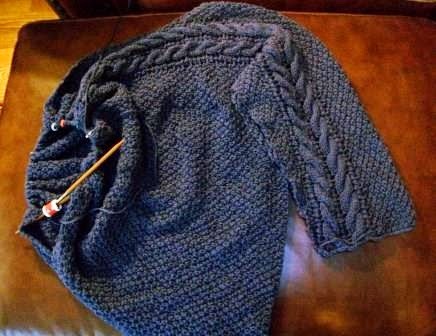 Even rows now will be same as row 32 until there are 17 stitches between markers. Do next row in pattern (ie like row 33, knitting all stitches between p1 and lace panel section), then the next row (not sure what the number is as I ended up repeating the lace panel pattern a total of 4 times by the time the gloves were finished rather than twice as called for by the original pattern. Anyway on the first even row after getting to 17 stitches between markers, p1, knit 4, remove marker, place 17 stitches on waste yarn, remove second marker, add 1 stitch by using yarn to “cast on stitch”, K5, lace panel, K7, *p1, K4* to end. 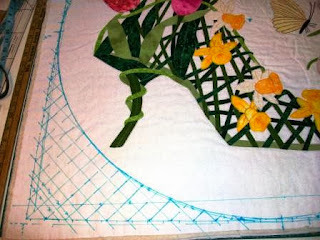 Continue in pattern to end of the 4th repeat lace panel. Repeat Round 1-4, then bind off. place 17 stitches from waste yarn on needles and pick up 3 stitches where inside of thumb joins mitt for total of 20 stitches. Knit 3 rounds. Knit round 1-4, then bind off.